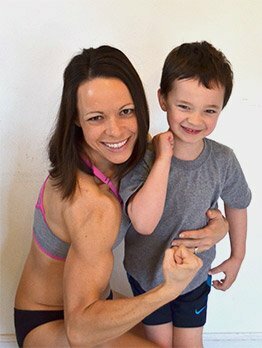 Body Transformation: Joanna Boyles, The Super-Fit Mom! Joanna shows her kids and the people around her that the life of a stay-at-home mom and being super-fit can commingle. Throughout high school and college, I was able to maintain a healthy weight. I&apos;d always been active outdoors, hiking, skiing, or rock climbing. After graduating college, getting married, and getting my first office job, the weight started to come on quickly. Too many bad meals coupled with a sedentary lifestyle put me at the heaviest I&apos;d ever been. My weight fluctuated a lot for the next several years, staying more up than down. When I had my first child, I gained 55 pounds during my pregnancy. I was able to lose a lot of the extra pregnancy weight by the time my second child came around 10 months later. I&apos;d gained about 35 pounds during that pregnancy. Being a new mom of two very little ones, I was exhausted and didn&apos;t know exactly what I was doing. All I knew was that I didn&apos;t like where I was, mentally and physically. I did not want to be overweight, feel lethargic, and always feel sick. More importantly, I started to think about how I wanted to raise my kids. I wanted them to learn respect and self-discipline, and most importantly, to grow up active and healthy. How was I to teach them these values when I obviously wasn&apos;t living them myself? Change was needed. I picked up a fitness magazine that featured a figure competitor and fell in love with her physique. I thought, "How cool would it be to have a body like that after having two kids?" I&apos;ve always loved exercising and lifting weights; I just didn&apos;t really know what to do or when I was going to do it. After a lot of research, planning, and motivation, I finally learned how to eat right and make my own workout programs. Through a lot of practice, I was able to turn it into a lifestyle and get the results I had always dreamed of. After deciding that I wanted to be a stay-at-home mom and quit my job, I couldn&apos;t afford a gym membership, much less a trainer. So I had to do my homework and learn what I could do from home. I&apos;ll admit that I&apos;m an organizational freak. I like to have all of my information and take on challenges head-on. So I spent a lot of time on Bodybuilding.com and other fitness sites as well as magazines, to learn proper routines and forms. I had an assortment of dumbbells, a Swiss ball, some resistance bands, and a hand-me-down treadmill. I signed up for the 2013 Bodybuilding.com and Dymatize 12-week transformation challenge with determination. I planned my workouts during nap times and mapped out all of my meals—and I started getting results. I was amazed by my progress pictures, and seeing my body physically transform. I didn&apos;t win that challenge, but I didn&apos;t care because I had gotten in the best shape I had ever been in. Along with that, I had regained my energy and health. I had increased self-esteem and spiritual growth, and I felt like I had control over my life. "I&apos;ve come to live by the three D&apos;s: Diligence, Discipline, and Determination." After that first challenge and my final picture, I was reminded of what happens when you stop your normal routine. My final results did not last long. I did not completely lose everything I&apos;d worked for, but I was devastated to see my abs go away. That&apos;s when I learned that this needed to be a lifestyle, and not just a 12-week challenge. I still work out exclusively from home. Throughout the past year and a half, I&apos;ve added several other dumbbells, a workout bench, a barbell with some plates, a DIY box jump, and a pull-up bar. I&apos;ve had to move my workout times around to meet the needs of my family. I now have to wake up an hour before everyone to get a good workout in. Even my kids have started to join me with their 1-pound dumbbells—it&apos;s so empowering to see them so excited about exercise and healthy eating habits. I find my motivation from my faith and my family. My faith helps me to find balance and strength, and my family inspires me to keep pushing harder. I&apos;ve come to live by the three D&apos;s: Diligence, Discipline, and Determination. I&apos;ve found supplements to be very important to help keep my body running smoothly and help with muscle recovery. When I first began to transform, I ate 6 small meals a day every 2-3 hours. I&apos;ve since incorporated intermittent fasting into my diet. I eat my first meal at 12:30 p.m. and my last meal around 8:30 p.m., then I fast for the following 16 hours. I now eat about 4 meals, usually consisting of lean protein, complex carbohydrates, and some healthy fats, but they are larger. I&apos;ve found that IF works well with my body, and most importantly, with my busy schedule. I tend to stick with some sort of salad for lunch and snacks, but like to vary it for dinners. I try to use proper portion sizes and eat clean 80-90 percent of the time. I do not count calories or macros, and I admittedly still have cheat meals once or twice a week. I like to design my own workout programs so that they fit my goals and work with the limited equipment I have. When I started, I liked doing straight sets and supersets, although now I enjoy circuits because they&apos;re fast-paced and keep my heart rate going. I do a lot of circuits, in which I perform all exercises in a row with no rest, then rest for 1-2 minutes until the next full circuit. Maintaining my diet and finding balance were the most challenging aspects of my transformation. I did not mind the training aspect. I looked forward to it, as it was my outlet—my "me time." However, the diet part was much harder to get consistent with. I am a severe chocoholic and overeater. I do well staying on track for a long time, but once I allow myself a cheat, it&apos;s like the floodgates open and I want to stuff my face. One thing that helped me get over my obsession with chocolate was to give up chocolate for Lent. It was amazing how much spiritual and inner strength was required to abstain from my love for chocolate. I now look toward that inner strength when I want to overindulge. It is also helpful to look at progress photos regularly to remember how far I&apos;ve come when I want to splurge. I now look at food as fuel and know that when I eat like crap, I feel like crap. Finding a healthy balance between fitness and family life has also been beneficial. Despite the desire to have a flat tummy and low body fat percentage, I must remember that I am first a mom and wife. My family does not want to eat perfect all of the time, and I wouldn&apos;t want to make them. We like to have a pizza night and go out for ice cream every once in a while. I don&apos;t want to be so rigid that I won&apos;t let my 2-year-old feed me her Teddy Grahams. "Right now my focus is on being a good mom and healthy influence for my kids." I actually have zero plans for competing at this time, but I love seeing photos of competitors. It might be on the bucket list sometime down the road, but right now it&apos;s not an interest of mine. I would love to become a trainer someday as well, but that&apos;s not where I&apos;m at. Right now my focus is on being a good mom and healthy influence for my kids, being a good wife to my husband, and finishing up my graduate degree in counseling. I just want to be an encouragement to anyone who needs it. I am a volunteer Community Health and Education Resource Person in my community and help out when needed. I&apos;m also in the initial stages of setting up a women&apos;s ministry, where several women get together a couple times a week for a group fitness class and Bible devotion. I also think it would be great to start some type of health and fitness counseling program, especially for children, after I earn my degree. So many people think that this lifestyle is unobtainable and only for those chasing a spot on stage or a spread in a magazine, but anyone can change. Anyone can make improvements to their health. Anyone can build and transform their bodies into their desired physique. It just takes diligence, discipline, and determination—triple D&apos;s. Start with small goals, small changes, and build up to bigger ones. Don&apos;t expect it all to happen quickly or at once, because it won&apos;t. Keep reminders around that will keep you in check of your goals. Take progress photos or journal about your accomplishments. Do the research and don&apos;t be afraid to ask for help. And even if you don&apos;t have the best resources, the important thing is that you give it your best with what you do have! I am forever grateful to Bodybuilding.com. They have been my personal trainer, my information resource, and my motivation. I go to the site almost daily. I love interacting with friends on BodySpace who have the same love for fitness as me. Karin didn&apos;t let anything get in the way of her commitment to training and her diet, even if she had to eat cold chicken and fish in the car. Body Transformation: Paula Knaley Is In The Shape Of Her Life! When the going got tough, Paula turned to her new healthy lifestyle for strength, and it paid off! Becca is a total rock star around her family and friends, as her transformation has inspired them and left them all in awe.